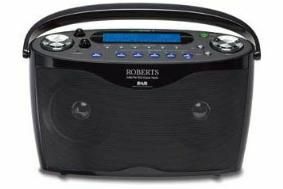 Roberts claims "longest ever" battery life for ecologic 7 DAB radio | What Hi-Fi? The company claims that this is "more than any other portable DAB radio on the market". It runs on six D-size batteries, or the mains. Designed for indoor or outdoor use, the ecologic 7 has a built-in carry handle, 20 presets, DAB/FM tuner with RDS, a clock with multi-function alarm and adjustable sleep timer. Additional features include bass and treble controls, headphone and line-in sockets, and an AC adapter. The Roberts ecologic 7 is available in black or white for £90.